For 12 years Facebook has been part of our personal lives, coming with us to parties, on holidays, helping us keep in touch and keep tabs, but we’ve always made an effort to keep it separate from our professional lives. Now, though, Facebook is putting on its suit and insisting on joining us in the office with the launch of its new professional communication tool, Workplace. Conceived, built, and now launched in Facebook’s London offices, Workplace is a tool that will allow colleagues to send one another group and private messages in order to collaborate and share information on work projects. Facebook has been developing the platform for over two years, and it entered its closed beta phase last year with some big names like the Royal Bank of Scotland and Danone signing up to test it out. It’ll be important that Facebook continues to attract the attention of big corporate bodies like this since it’s entering a very competitive space that includes enterprise communication giants such as Slack and Microsoft’s Yammer. These platforms already have loyal and large user bases and it might prove challenging for Facebook to draw them away. However, Workplace does have a distinct advantage over these other platforms in that its user interface is based on one over a quarter of the world is already familiar with – Facebook. 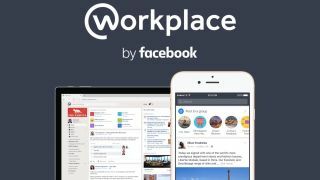 Like ordinary Facebook, Workplace is available on the web and in a mobile app, though Facebook does say that Workplace is more of a mobile-first platform for constantly fast and easy access. As you'd expect, there’s a News Feed keeping you up-to-date with business and colleague activity. There’s also the ability to chat in groups and privately, as well as share documents and videos within these chats. Facebook Live, a relatively recent addition to ordinary Facebook, is also a feature on Workplace, something its developers think could facilitate things like live Q&A sessions with company CEOs, which would greatly open up communication and increase transparency within a company. Opening up company structures is a goal Facebook is really pushing with workplace, with head of EMEA Nicola Mendelsohn saying the point of the platform is to encourage ‘fast’ ‘open' and ‘frictionless interaction’ across all levels. For businesses struggling to engage all of their employees in their in-house chat programs, the familiarity and relative ease-of-use offered by Workplace could prove to be incredibly attractive, and will almost certainly boost adoption of the service. Even for employees that aren’t users of Facebook, a personal account is not a requirement to set up a corporate account, nor is an email address. Those that do have a personal Facebook account will be comforted to know that their employer will have absolutely no access to what’s posted on there as the accounts remain completely separate. Though their user interfaces and functionalities are similar, much like your personal self and world self, there are differences between Facebook and Workplace which include a more sober dark gray color scheme and a lack of ads. It will also include features that are specifically useful for businesses, such as multi-company groups. Knowing that ‘no company is an island,' Facebook has introduced this feature in order to allow companies to interact with other partner companies as well as communicate internally. Clearly Facebook is on the right track with its platform. Workplace might have just launched but it already has 1,000 companies signed up and it's proving particularly popular in India, Norway, the US, the UK, and France. As Workplace doesn’t feature ads, for the first time Facebook will be charging for one of its services. How much a company pays for Workplace depends entirely on how many people it has using it; the more people in your company using the service, the less your company will pay per individual user. For up to 1,000 active monthly users it will cost $3 per user per month, for 1,001 to 10,000 users it will cost $2 per user month, and for over 10,001 active users it's only $1 per user per month. To keep the service as accessible as possible, Facebook has said nonprofit and educational organizations will be able to access the service for free. Workplace is open for business from now, with businesses able to express interest through the Workplace site.